PHYLLIS L. SPESER, JD, PHD, has been involved in technology transfer in a variety of roles: professor, inventor, policy maker, analyst, and broker/deal maker. She has twice served on the board of the TechnologyTransfer Society, was a gubernatorial appointee to the Washington Technology Center, and currently serves on committees of the Licensing Executives Society and the Association of University Technology Managers. She has taught at SUNY Buffalo, the American University (Washington DC), and the Universität Mannheim (Germany). A cofounder of Foresight Science & Technology,she is the developer of the Technology Niche Analysis and Virtual Deal Simulationmethods used by Foresight. Phyllis Speser is a recipient of R&D awards in artificial intelligence from the National Science Foundation, U.S. Department of Agriculture, U.S. Department of Education, and U.S. Office of Naval Research, for work which was successfully commercialized. She also has supported the commercialization of technologies for corporate, university, government, and nonprofit lab customers across the spectrum of science, engineering,and other industries globally. 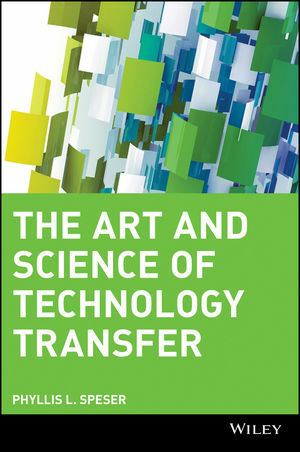 PART ONE: The Game of Technology Transfer. Chapter 4: Finding the Customer. Chapter 7: Positioning the Technology for the End User. Chapter 9: Finding the Target. Chapter 10: Valuing the Technology. Chapter 11: Doing the Deal. Chapter 12: The Twelve-Step Program.